What's The Worst Subscription That You Pay For? Our Chatroom on cutting the cable cord got me thinking about our subscription culture. In recent years there has been an explosion of products delivered monthly in boxes, alongside a variety of streaming media paywalls. Some of us keep shelling out even when we don’t find the product to be that useful. What do you firmly need to press “cancel” on? Why Haven&apos;t You Cancelled Your Cable? Subscription services are hardly new. They helped build up most of the giant magazine and newspaper entities that reign today, and “X of the month” club offerings have been around for decades. 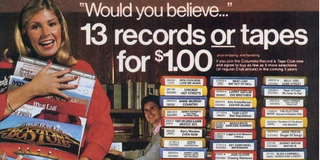 As a teenager, I got the bulk of my CDs from shady Columbia House deals like the one pictured above. These days, companies that once offered their content for free on the internet are dabbling in paywall models that often prove a success, because people will pay for access excellent services — piracy is always an option, but also a headache to the average consumer. However, I don’t think a day goes by when I don’t see brand-new “box of the month” subscription sponsored into my Facebook feed. At this point I can get everything from wine to clothes to geek toys to healthy treats for my cat to different kinds of bacon delivered to my door with regularity. I worry about our worldwide expenditure of cardboard. I wonder how sustainable these models are, and how many of them are worth it. As for me, as mentioned yesterday, I need to cancel my Hulu+ subscription. I signed up months ago to help show actual viewership for Marvel’s Agent Carter, which was floundering in ratings. But the show has been renewed, and I never touch Hulu+ these days. The fact that you’re still served ads while paying for a premium service makes it the least tempting of streaming media options. In the interests of full disclosure, my mother paid for America Online for at least three years after we got cable internet, because of the difficulty of getting through to someone to actually cancel. I’m pretty sure AOL continues to receive a big chunk of change from people who don’t realize they’re still paying for it, or think they have to do so to maintain their @aol.com addresses. Yes, some people still maintain @aol.com addresses.